Village life comes to life in the little piazza where locals to and fro buying bread, sitting outside bars and watching the world slowly go by. The piazza is dominated by "Castello Ruspoli" and imposing fortified 11th century castle built by the Orsini family and now owned by the Ruspolis, both princley roman families of old. " casa della roccia" a Vignanello is just a few meters from the Castle which is also known as one of Italy's oldest formal Italian gardens much beloved by Handel no less who stayed here. In a tiny piazza with its own witty 18th century fountain, the house is found within an old palazzo on the first and second floors. Finely restored to a high standard the house meanders up through the palazzo to the top floor and furnished roof terrace which offers fine views of the Cimini Hills, the rust-coloured roofs of Vignanello and a dramatic gorge which sides one half of the village. The first floor has a kitchen which than moves on the lounge and separate dining room both with village and countryside views.Upstairs there is a large reception room with a fireplace and the three spacious bedrooms verge off from here. A double four-poster bedroom has pastel drapes and an art-nuoveaux ceiling frescoe. There is another double and a large bright double room with a futon bed, a fireplace and a stairway upstairs to the roof terrace. Contemporary and antique furniture fill the diverse and characteristic interiors. 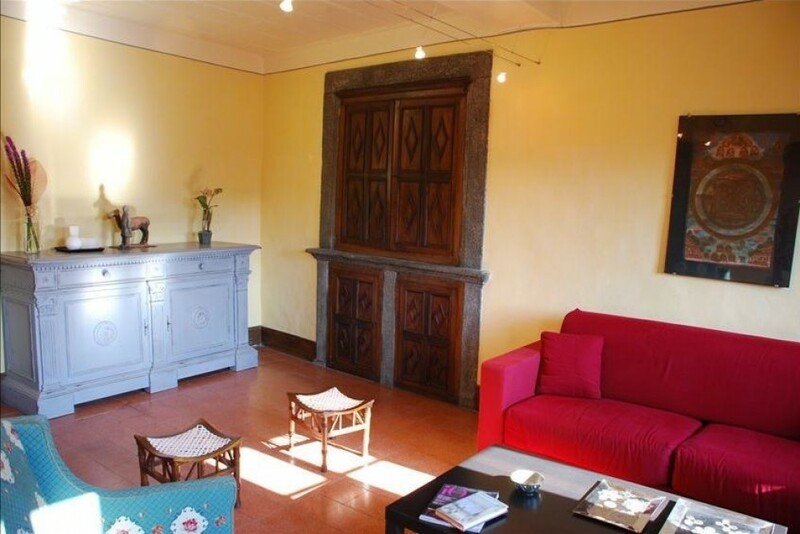 Vignanello sits half way up the Cimini Hills so is nice and cool in the summer and has all essential facilities within walking distance including bars, restaurants, supermarkets plus your car can be parked close the house next to the Castle. the castle itself presents a handful of concert events throughout the year. Nearby Orte (18 Km) was one of the 11 confederational cities of the Etruscan world and indeed it still sits high on its original tufo plateau. Viterbo ( 18 Km) a papal seat for 24 years during the medieval period, a certain papal grandeur still holds the city especially around the Cathedral and Papal Palace. Viterbo also has an all-year-round SPA colled Terme dei Papi whit hot mineral SPA.